Of course, I heard the idea first years ago and thought it was daft – a network whose only visible means of support was big-time football and basketball, showing all the other random sports at a loss and filled with those low-budget promotional programs for universities. I thought they were silly to prefer their own network to the massive exposure of the big four and other sports networks. But if you think of something like the Big Ten Network (which I’ve never watched, by the way) as a melange of ESPN, CNN, PBS, and (here’s the surprising bit) C-Span, the equation gets really interesting. Here’s why. A network like the Big Ten Network – with coverage of 35% of the nation (I assume that measures territory, not population) cuts out the middle man on keeping the profits for its major sports. Of course this was the intent. They knew going into the TV business that they would have to rely on non-revenue-generating athletics to fill most of their content. But as it turns out, these have “overperformed.” So the lower profile athletics are now turning a profit – I assume by providing what actually turned out to be interesting content off of which to hang advertising. This is what Delany referred to as “extending” the brand. Further – the biggest potential I see is not for current events coverage to be the public service – but a two-pronged reimagining of the member Universities. First, the fact that it could provide a medium for the dissemination of academic work. Imagine academic conferences, lectures, and public education airing just a few hours after Ohio State Buckeyes’ games. This realizes the true heterodox mission of the American university system. Second – and most importantly, universities are growing in power and influence by the day, and the public needs to be allowed scrutiny. On this “Big Ten Network,” the universities of the Big Ten, and the administrative structure of the Big Ten should be given the C-Span treatment and exposed to the public; allowing analysis, critique, and contribution. Especially considering most of the conference is composed of large state-run schools, this accountability is essential and powerful in allowing the population to be partners in defining – or at least understanding – the changing nature of the University and its place in the American system. In short, having a unique position in the American governmental and business landscape, Universities are changing. The existence of the Big Ten Network is proof of this – and its potential reaches far beyond sports into the community as news about that community; but most interestingly opening the classroom and the university boardroom to the public they are supposed to serve and extending the mission of the University in the exercise of American civil society. The success of collegiate athletics has led to an elevation of the whole system of higher education ever since the rise of football in the early 20th century, and this is another evolution of that, which could change the landscape not only of education, but of the media for good, and for better. I was thinking about emergence, possibility, and narrative today. Then I ran across these two pertinent articles. Almost all generative systems define a range of possible outcomes – a space of potential forms that can be vast. Often the visual complexity in generative art is actually visualizing a part of this form-space by overlaying or combining a range of forms into a single outcome. As discussed in the generative art article, there’s the element of what Eno calls “surrender” that unites the work here. 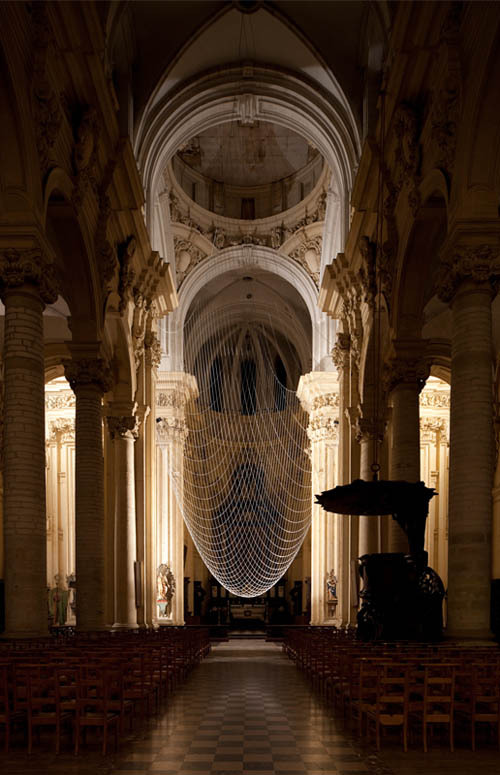 Only – what differentiates architecture as a spatial exploration in the catenary net from the visual complexity of the draughting exercises in the second is the surrender to an undeniable and very non-virtual force. Gravity. Therein lies the grace that is both architecture’s biggest liability and its most substantial contribution as a critical practice. Speaking of emergence, take a look at another Bldgblog post that will be the subject of much more speculation soon.